Kannada theatre owes much to Gubbi Veeranna, the man who founded the drama company that’s popularly known as ‘Gubbi Veeranna Nataka Company’. He was a drama producer, director and an artiste; and most importantly, he was a man who was passionate about his craft. It was this very passion and single-minded dedication that led to the birth of his drama company and the development of Kannada theatre in general. 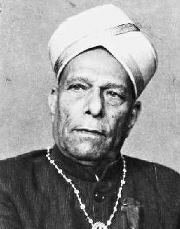 Gubbi Veeranna was born in the year 1890. His name is derived from his birthplace Gubbi which is located in the district of Tumkur in Karnataka. Much of what is known about Gubbi Veeranna relates to the resounding success of the drama company that he started. There was a time when there were around 150 people working in his company, which is a large number for a touring theatre group. The artistes and support staff traveled throughout the state of Karnataka, performing at a number of places. The troupe was extremely famous and people were ever-willing to buy tickets to watch their shows. At some point, the company’s Mysore branch was so incredibly successful that the profits from there alone could sustain the whole business. ‘Sadarame’ was one of the most famous plays to be staged by the company. Gubbi Veeranna also acted in some of the company’s plays. The troupe is credited with being the first theatre group in Karnataka which allowed female artistes to perform on stage. Prior to that, drama companies used male artistes for both male and female roles. Renowned Kannada film actor the late Dr Rajkumar started his acting career as an artiste with Gubbi Veeranna’s drama company. The late B V Karanth, who was one of India’s most talented theatre directors, was also employed with this company during his early years. Gubbi Veeranna did not stop with theatre alone. He later started his own film production house to make Kannada films. ‘Bedara Kannappa’, starring Rajkumar, was one of the earliest films he produced. Gubbi Veeranna even acted in some of the films that were made by his production company. Gubbi Veeranna had four wives, with a couple of them being artistes in his drama company. When B V Karanth during his younger days did not have the means to fund his own education, Gubbi Veeranna was one of the people who helped him out financially. This prominent personality met his end in 1974. The ‘Gubbi Veeranna Award for Excellence in Theatre’ has been instituted by the government of Karnataka in his memory.